My Modern Drummer interview transcripts were often longer than their corresponding published interviews. Each Modern Drummer had only so many pages, plus it is the rare interview that isn’t more readable after editing. When I began posting segments from Mr. Copeland’s tanscript I could not remember when, if at all, the interview was published. I left MD in October 1983. With my interviews published after that date I’m missing memories of the hands-on work of putting together the MD issue involved. 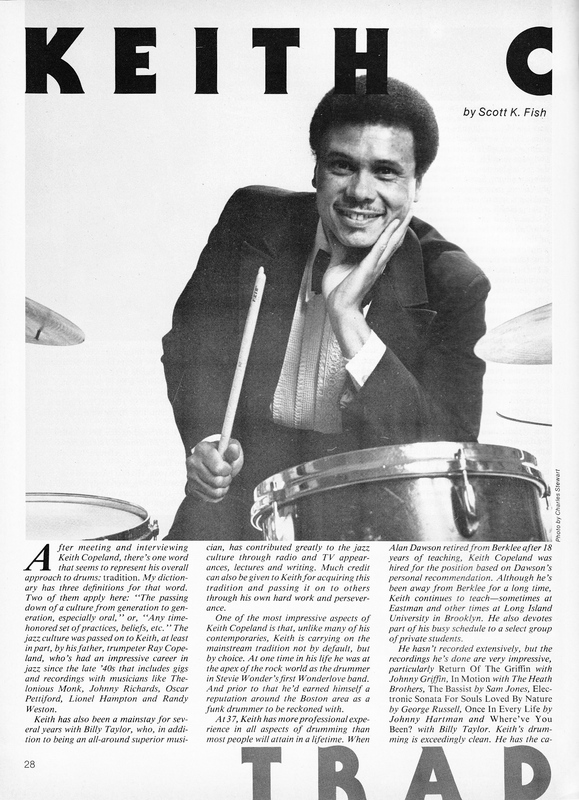 Even as of this writing, neither a Google search nor a search of Modern Drummer‘s web site shows any online reference to Keith’s feature interview. Here then is Keith Copeland’s May 1984 MD interview. It’s a keeper. This entry was posted in SKF Blog and tagged Drummer, Keith Copeland, Modern Drummer, Scott K Fish, SKF Blog. Bookmark the permalink.